Amanda Blake wants to change the way you think about your health. The woman behind Sprout & Pour juicery and café recently relocated to Founder’s Station on Morris Avenue. From her new location, she serves up clean, plant-based foods, juices, smoothies, and lattes that come with a side of community responsibility and a dash of non-intimidating wellness education. Amanda, how did you first begin your personal journey into wellness? 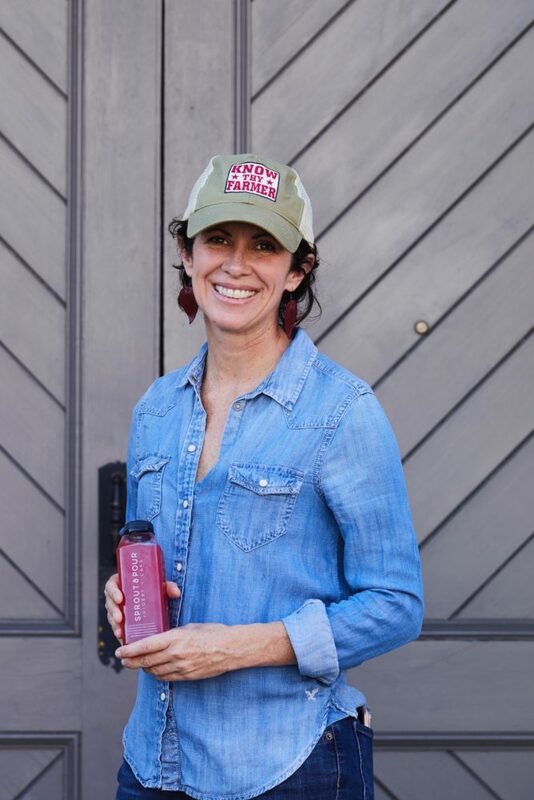 My mom was an advocate of healing through foods, and I was an athlete and trail runner, so I grew up knowing the importance of fueling my body to perform. In 2014 I suffered a miscarriage and a subsequent illness that was misdiagnosed as walking pneumonia. The incorrect treatment completely messed up my GI tract; I couldn’t keep anything down and could barely get out of bed. I sought out a specialist who ran tests on everything from my thyroid to my gall bladder and finally prescribed anti-anxiety medication. After carefully considering my symptoms and medical options, I began to research a more holistic approach. My sister introduced me to juicing, and my health quickly began to improve. I got my first Hamilton Beach juicer for Christmas and began researching how to integrate probiotics and other ingredients into my diet to help improve my gut health, fight fatigue, and reduce anxiety. How did you decide that you wanted to turn this into your career? I started sharing my juices with neighbors after I experienced my own health improving. The more I researched, the more I learned about juiceries in other cities who were serving their communities. Nothing like that existed in Birmingham at that time, so I created a Kickstarter and acquired the funding I needed to start my business. In 2014, there was a freeze and Pepper Place Farmers Market had a couple of cancellations that allowed me to get a booth there. That led to meeting and partnering with some local farmers who I could source produce from and ultimately enough business to be able to open a brick and mortar location in Edgewood. As an entrepreneur, there are always ups and downs. What challenges have you experienced? What accomplishments are points of pride? I am definitely a right-brained individual. I love coming up with new ideas, but the day-to-day economics of running a business challenge me personally; I am always learning. I am also one person and a single mother running this business by myself, and sometimes there just aren’t enough hours in the day or enough of me to go around. What makes me proud is a full lunch hour. When I see my regular customers and new downtown neighbors who live and work in the neighborhood choosing Sprout & Pour, enjoying the foods and juices, wanting to try new things, and feeling fulfilled and appreciative and excited about what they are consuming, I feel like I’m accomplishing my mission. You are a champion for balanced eating. How does that translate in your own diet? I love the way I feel when I am focused on my health, but I’m not against indulging occasionally. My personal favorites at Sprout & Pour are the “Kale Yeah” smoothie, which is rich in potassium, folic acid, omegas three and six, protein, and super satiating, and the “Beet Tonic,” which is loaded with beta carotene, antioxidants, folate, and vitamins A and K. But, life is short and Victor at The Essential makes a ham sandwich that is good to the last bite. I also can’t get enough of the pizzas at Gianmarco’s Pizzeria. Speaking of indulging, Valentine’s Day is approaching. What are some healthier alternatives to the traditional box of chocolates? Ooh! I will have some delicious dark chocolate and strawberry treats and dark chocolate energy bites. The flavors in our Golden Tea latte are rich and spicy, and we have wellness shots with cayenne pepper to spice things up. What are your goals moving forward as you settle into your new location and build your business? I really have been fortunate to partner with some amazing vendors: Snow’s Bend, Belle Meadow, and Jones Valley Teaching Farms, where I am collaborating on a community event this spring. I loved playing a part in the Birmingham Wellness Passport, and I hope to see more programs like this continue and grow in our city! Expanding Sprout & Pour’s delivery and shop locations are my current priorities, and I want to work towards becoming the leading hub for wellness in Birmingham.